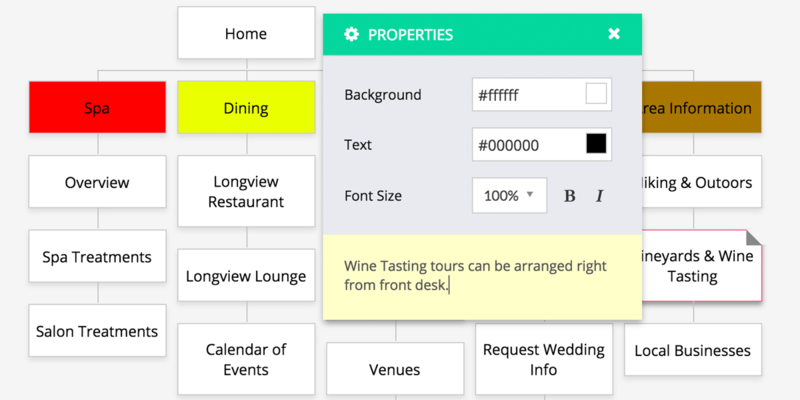 With GlooMaps it's really easy to create your own sitemaps fast and efficiently. Click a box to attach a child box, drag & drop to reorder or double click a box to enter text. As easy as sketching on paper! GlooMaps is available for free. No user account needed - once you are done click SAVE and we will display you your URL where you can access your created sitemap. You can also share this URL with any co-workers or stakeholders. The sitemap is available for 14 days unless re-visited. Every new visit extends the link life for another 14 days. You can export your sitemap to PDF, PNG, XML or straight to HotGloo - our UX wireframe & prototyping tool.